2017, October 6-8: The Pedestrian Bridge will be installed this weekend over Route 222 (Beaver Valley Pike) at the old "tunnel" location. The road will be closed beginning on Friday evening at 7:00 p.m. and will reopen at 6:00 a.m. on Monday, October 9, 2017. This is an important link in the Enola Low Grade Trail! Exciting news! 2017, June 26: Beginning July 5, 2017, you will begin to see work commence on the Route 222 Pedestrian Bridge Crossing. Kinsley Construction is the general contractor for this project. You will first see some land clearing/grubbing followed by the installation of under ground trenches parallel to Route 222 which will carry electricity through this area. The bridge is expected to be completed in April, 2018. 2017, May 1: General Update. Martic Township and Conestoga Township plan to place a new surface on their respective trail portions in late spring, early summer. When this work is completed, you will have a new surface down from Safe Harbor (Conestoga Township) to Fairview Road (Providence Township. 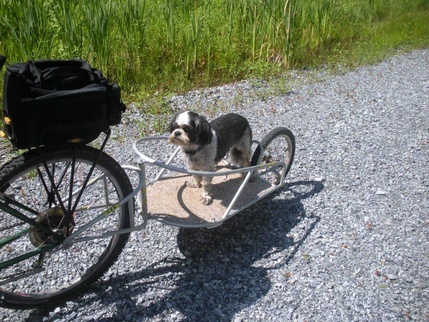 This will allow for smooth riding and walking of approximately 14 miles. 2017, Spring and Fall: General Update. The townships of Eden, Bart and Sadsbury are in the process of applying for funding through the Pennsylvania Department of Conservation and Natural Resources to begin design work for the remaining portions of the trail in Lancaster County. These townships also plan to apply for construction funding through the Transportation Alternatives Program. The construction of these areas is expected to begin in 2019. 2017, February 22: Providence Township. This evening the township supervisors awarded the construction contract for the construction of the pedestrian bridge over Route 222 to Kinsley Construction from York, PA. The contract amount was $1,916,758.00. The construction of this bridge is expected to begin in early June and finish in April of 2018. 2016, Fall: Providence Township. Fairview Road Parking Area #2 has been completed. The address for this parking area is 165 Fairview Road, New Providence, PA 17560. In 2015, the trail through Providence Township saw increased recreational usage! People began to enjoy and appreciate the beauty of the trail. This trail is an asset to Providence Township and Southern Lancaster County. The Martic Forge Trestle was opened for public use this year as well. It is great to see all the recreational use on the trail: bicycling, running, jogging, walking, snow-shoeing, and cross country skiing! Get out and have fun! 2015 has also been a year of design work going on behind the scenes. Engineers are working on the planning, design and permitting involved with the installation of a pedestrian bridge at Route 222. Plans are also being drafted for major improvements to the trail in Eden, Bart and Sadsbury Townships. So much is happening along the Trail this summer! Trail surfacing between Fairview Road & Sigman Road is close to completion. The parking area at the Fairview Road Trailhead is in the process of being improved. The Sigman Road bridge is in place, and will be completed shortly. We are also improving the Trail Grade along Oak Bottom Road! Local visitor checking out the new surface! 2014: The Township, in conjunction with Conestoga, Martic, Eden, Bart and Sadsbury Townships, has applied for an additional Transportation Alternative Program Grant in the amount of $1.1 million. This will cover additional trail surfacing in Conestoga and Martic Townships and major storm water improvements in Eden, Bart and Sadsbury Townships. The Township has also applied for a PA DCNR Community and Conservation Program Grant in the amount of $180,000. This grant would be used to fund the cost of design and engineering for the work to be completed under the TAP Grant. 2013: Conestoga, Martic, Providence, Eden and Bart Townships were awarded an $800,000 Federal Transportation Alternative Program Grant. This grant will be used to construct a pedestrian bridge over Route 222 and provide additional storm water remediation along the trail. New installation of safety signage made possible from the grant provided by the Lancaster Bicycle Club! Thank you Lancaster Bicycle Club! As visitors of the trail have learned, the section of trail running through Providence Township offers wonderful encounters with nature along the way. The Township property making up the trail consists of a main trail, which is also bordered on each side with a varying width of Township owned habitat, which creates a natural corridor from one end of the Township to the other. The trail surface is bordered with a wide range of habitats, including; woodlands, wetlands, and meadows. The varying habitats attract a wide range of not only birds, but also some of the more elusive mammals and amphibians in Southern Lancaster County. Visitors this year have been treated to all types of encounters along the trail. One regular user of the trail, Sally Graybill, of Providence Township, has captured many of her sights this year along the trail and is working on creating a photographic diary of her encounters. Sally hopes that her photographs will provide local youth some extra incentive to explore the trail not only for recreation, but also as a way to educate them on the wide range of local wildlife that exists right here in our backyards. Next time you’re on the trail, take a look around, as you never know what you may see; a mink crossing the trail, foxes at play, a killdeer faking a broken wing, a snapping turtle floating in the wetlands, a Green Heron hunting frogs, or simply trying to figure out what tracks you see along the trail. Take a break on the trail. Stones from removed bridges in the Township have found a home on the trail as benches. 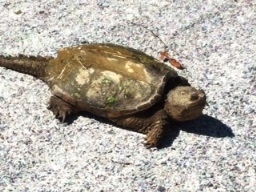 Hitching a ride on the trail near Sigman Road! 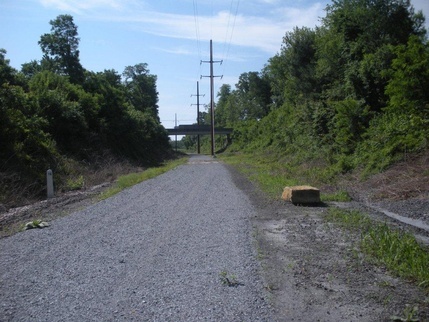 Lancaster County Planning Commission Features the Enola Low-Grade trail in "Staff Picks".